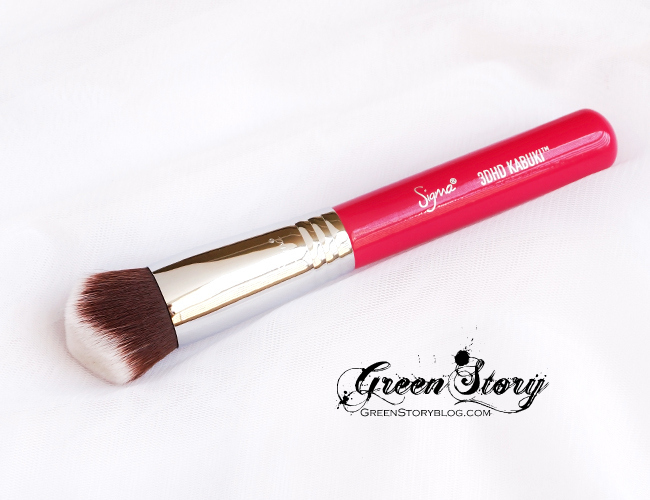 Sigma 3DHD Kabuki Brush | Face Makeup Brush with 3-Dimension -works or not? Sigma 3DHD Kabuki, a brand new and quite innovative face makeup brush by Sigma Beauty. They say, “Experience Beauty in 3D”. Interesting, isn’t it? At first glance, honestly, I thought it is weird to apply face makeup with a triangular shaped brush! Luckily, It didn’t take me long to understand the unique fact hidden in that triangular shape. So, I got myself one to experience it. This brush is available in three colors; white, black and pink. I picked pink one. The 3DHD Kabuki is a multi-functional brush engineered to perfection. It was uniquely designed for all areas of the face to apply liquid, cream and powder products uniformly on every curve, crease, and angle. Patent pending. Ridge: The functional ridge at the top of the brush has the perfect angle to apply liquid, cream or powder products reaching every curve, crease, and angle. Designed with a structure that is effortlessly multifunctional, 3DHD will do all the work for you, without having to move a single muscle of the face. Dimensions and density of fibers: The dimensions of the brush head were developed to provide fast product application while the density of the fibers allow for buffing products onto the skin. The fine fibers allow for coverage of skin pores. I’ve used the flat top buffer brush to stipple brush from various brands to apply face product. I must say, still best foundation application I get from the original Beauty Blender. Yet when I’m in the rush I completely depend on brushes because it’s less messy. Earlier I was hooked with Real Techniques buffing brush to apply foundation. Had to use other brushes for concealer. I also had to use a couple of more brushes for overall blending. Sigma 3DHD Kabuki Brush alone replaced all my other brushes. Sigma 3DHD Kabuki Brush has super dense perfectly linear measured bristle. The fibers are amazingly soft and the barrel seems to have really high quality. I have been experimenting with it lately. I tried this brush with various kinds of product like thick, light, cream foundation and concealer of course. This brush blends everything effortlessly. It has that perfect size which is not too big or too small for a face. That unique angular edge of Sigma 3DHD brush easily reaches every impossible corner of the face where I had to use another small brush. Now I apply foundation with this brush and using the same brush I can do my concealing as well. This brush is also great for precise contouring. Here is one thing to note, for thin liquid foundation if you use swipe motion with the brush to blend then it leaves streaks. You’ll have to dab or stipple the brush to get a seamless finish. I haven’t used it for powder yet because I like to lightly dust powder. Although, I’m sure it will also be great for powder foundation. When it comes to clean this brush, I must mention, because of its finer density, it needs more effort than other brushes. I always find some product deep inside the bristle when I deep clean. Therefore, a regular deep clean is a must for this brush if you care hygiene. Overall, I’m loving Sigma 3DHD Kabuki Brush from the first use. This one brush saves so much time and delivers that perfect result. I agree with Sigma, it is a multi-functional brush indeed. If you haven’t tried this brush yet I highly recommend you to try. Use the code ‘GreenStory‘ for 10% OFF Storewide. All about the new 4DHD makeup brush addition by Sigma Beauty, read here. Now I’ve learn one more thing to talk with my female friends! hahaha, love ur explanation! 😀 it is even quite new in market! But totally an innovative one to work with. Thanks for the info, I always wanted to know more about Make-up brushes! I love the brush looks so fluffy and soft. Thanks for the intro! Time to make up with this nice brush! Great review! it sounds like a really multifunction brush. thanks for the recommendation! I’ve always wanted to try out the kabuki brush from sigma! Which does a better job? A kabuki brush, a stippling brush or a buffing brush? nice brush, haven’t try this before. Hehe.. any idea how many face brush we need? I always like the quality of sigma brushes!! The 3d look good! That look fluffy and handy to blend in and smoothen make up.